Avatar: Blockbuster film as socio-political and green allegory? Those words by American film producer and studio founder Sam Goldwyn (1879-1974) sum up Hollywood’s attitude to movie-making for the past many decades. As I watched James Cameron’s latest blockbuster movie Avatar, I kept wondering how the master film maker managed to subvert this so completely. Beneath the 3D, special effects and riot of other worldly colours, the movie is one long (2 hrs 40 mins) and powerful commentary on why might is not right when it comes to exploiting resources — belonging to other countries, people, or as in this case, other worlds. This is not just another worthy indie movie made by an idealistic movie maker defiant of Hollywood traditions and big money. James Cameron is one of the most commercially successful directors in the mainstream film industry – and perhaps one of the very few who can get away with this kind of stunt. 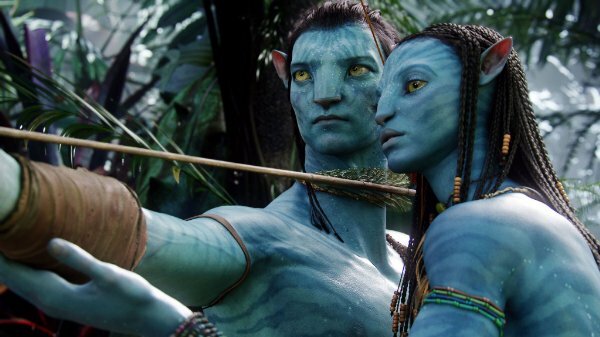 At a budget of over US$ 300 million , Avatar is one of the most expensive films ever made, and the costliest ever for 20th Century Fox. The big gamble is certainly paying off. On 26 January 2010 came the news that Avatar has surpassed Titanic as the highest-grossing movie worldwide. According to the studio, worldwide box office total for Avatar at that point stood at US$1.859 billion, beating the US$1.843 billion racked up by Cameron’s romantic drama in 1997-98. Avatar broke that record in a little over six weeks. Does the box office triumph of Avatar make James Cameron one of the most effective campaigners for social justice on the planet (comparable, in some ways, to Michael Jackson having been one of the biggest environmental communicators of his time)? And is Avatar the most expensive piece of info-tainment or edu-tainment ever made, just like the Lord of the Rings trilogy was one long (even if unintended) commercial for the breathtaking sights and sounds of New Zealand? Certainly, mixing messages with entertainment is such a difficult and delicate art that most people who dabble in it fall between the two stools. The entertainment value of Cameron’s latest flick is not in question. Granted, it’s not as heart-breaking as Titanic, and the storyline is oh-so-predictable. But 3D and SFX magic alone can’t hold today’s audiences gripped for 160 long minutes. And if the underlying story starts movie-goers thinking and talking about many parallels between the fictional world of Pandora and our own Earth, he’s certainly getting somewhere. Perhaps this wasn’t part of the script, but would the executives at 20th Century Fox care as they laugh all the way to their bank? 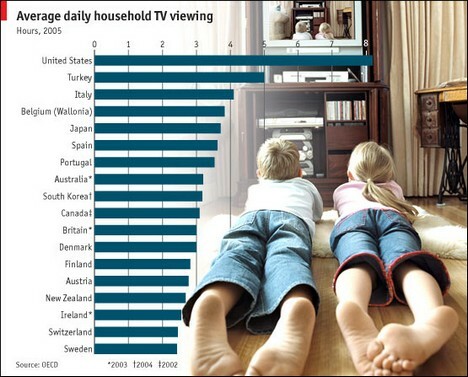 Scientists caution: Watching TV may shortern your life? Was there life before Television? Television has been called many names in the few decades it’s been around – among them the Great Wasteland and Idiot Box. Television used to be the favourite whipping boy of those who love to criticise communication technologies and consumer gadgets — until the Internet and mobile phones came along. 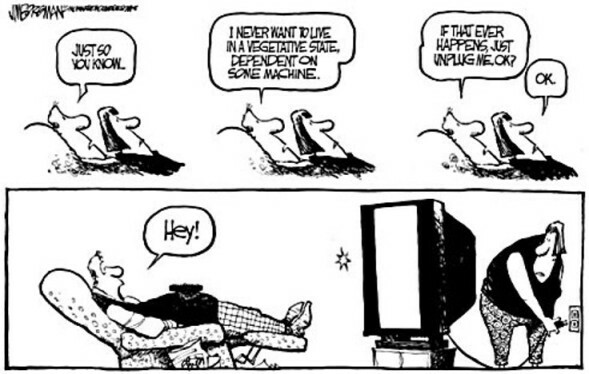 Couch potatoes of the world have ignored all snide remarks, and just carried on their sedentary practice. Now they might have to think again: Television may be hazardous to your health in more ways than previously imagined. In fact, it might shorten your life. A couple of weeks ago, Australian Broadcasting Corporation (ABC) Science reported some worrying news. It said Australian scientists have published research showing a link which suggests that the more TV a person watches, the sooner they die. The report, which appears in the journal Circulation,says every extra hour spent watching television increases people’s risk of premature death. Professor David Dunstan of the Baker IDI Heart and Diabetes Institute in Melbourne, followed more than 8000 Australian adults for six years. The team discovered that the people who watched the most TV died younger. Heads you lose, tails we win...? With over 10 million others, I voted in Sri Lanka’s sixth Presidential Election yesterday. 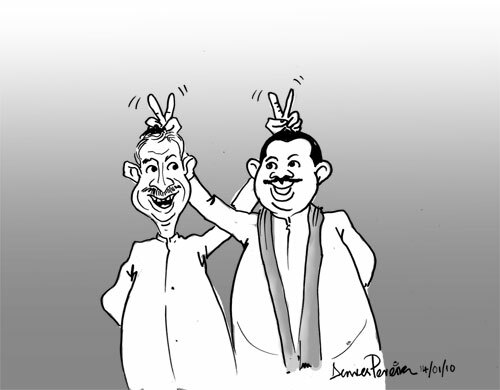 Today, after the votes were counted and tallied, we were informed that the incumbent President Mahinda Rajapaksa has been re-elected for another six year term. He has won 57.9% of the valid votes. Nearly 11,000 polling stations had been set up for this purpose, mostly at temples or schools. A quarter of a million public servants were mobilised to handle this massive operation, while close to 100,000 policemen and soldiers were tasked to maintain law and order. And the whole business of choosing the next leader is costing the war-impoverished nation several billion rupees. So do the results — basically, more of the same — justify all this cost and effort? Was there real choice for us the hopeful little men (and women) who walked into little booths with little pencils in hand to make a little cross on a (not so) little bit of paper? Opinion is highly polarised on that last question. The two main candidates not only tried to outpromise each other without coherence or focus, but also made a mockery out of the whole campaign process. With pre-election violence escalating, the choice before voters looked like this a week before election day. The election results will be analysed and debated for weeks to come. 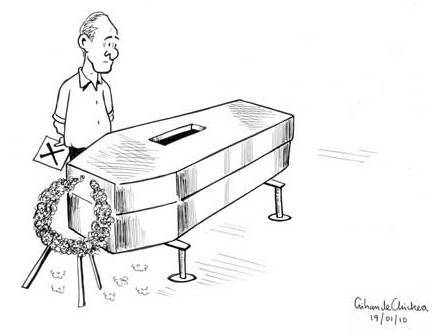 At first glance, it looks as if the voters used this election to express gratitude to Rajapaksa for having provided the political leadership to end Sri Lanka’s long-drawn civil war. We can argue whether presidential elections should be turned into referendums on individual performance of candidates – or instead, decided on the vision and policies offered by them. I grant this is a bit more serious than American Idol – or its local variations – where we text our preference for the candidate with the best looks or talent. In fact, I’m still not convinced whether it’s such a good idea to mix personal gratitude with voting for a head of state. I’ve voted in four presidential and three general elections (I missed some due to overseas travel). With one exception (1994), all have been ‘protest votes’ – I was voting against an incumbent more than in favour of an aspirant. We can only hope that our votes were properly counted — and that they count and matter to the leader whom we have collectively chosen today. That is, if he can see and hear beyond the cacophony of sycophants who surround him 24/7. Today marks exactly 250 days since Sri Lanka’s civil war officially ended on 18 May 2009. 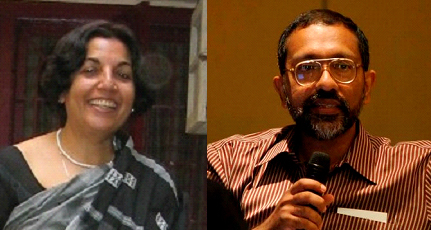 In a new op ed essay — titled ‘Open Moment’, Closed Minds! — just published on Groundviews.org, I look back and ask some hard questions. “We all knew the hard-won peace had to be nurtured and consolidated. We also realised just how formidable the challenges of healing and rebuilding were. But could anyone have imagined the dramatic turn of political events since? I ask whether either of the leading candidates has the open mind needed to seize the historic ‘open moment’ since the war ended. I recall how we completely missed the last such open moment created by the tsunami of December 2004. Despite the many disappointments of the past 250 days, I still remain cautiously optimistic. But for how long? This is one of history’s most famous photographs – and also one that is frequently misidentified. The man behind the space mask is a pioneer Moon walker – but it’s not Neil Armstrong. It’s the Buzz Aldrin, the second Man on the Moon. According to space historians, all the famous photos from the first Moon landing are actually of Aldrin, with Armstrong reflected in the visor. This is an occupational hazard for those who take photos! Buzz, who celebrated his 80th birthday on January 20, remains active and publicly engaged as he has been for most of the past 40 years since the first Moon landing in July 1969. I’m following Buzz on his Twitter feed, from which I find that he’s just back from a trip to Antarctica with a National Geographic cruise, was at the premiere for the movie Avatar in mid December, and is now busy promoting his latest autobiography, Magnificent Desolation. On his 80th birthday, Buzz asked fans to donate US$8 ot 80 to the Clinton-Bush Haiti Fund. 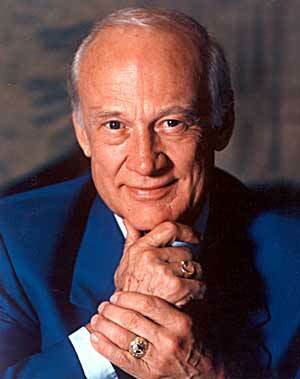 And he will soon launch my iPhone App, Buzz Aldrin Portal to Science and Space Exploration. This contrasts with Neil Armstrong, who is notoriously shy. He rarely speaks in public, turns down all media interviews and has also refused autograph requests since 1994. Trained as an engineer, the two-time space traveller Buzz has been keeping up with new media pretty well. He has his own website, and launched his own YouTube channel only a month ago, where we can see his latest broadcast and film appearances. Through these and other means, he continues to promote causes like space exploration, science education and nurturing imagination. 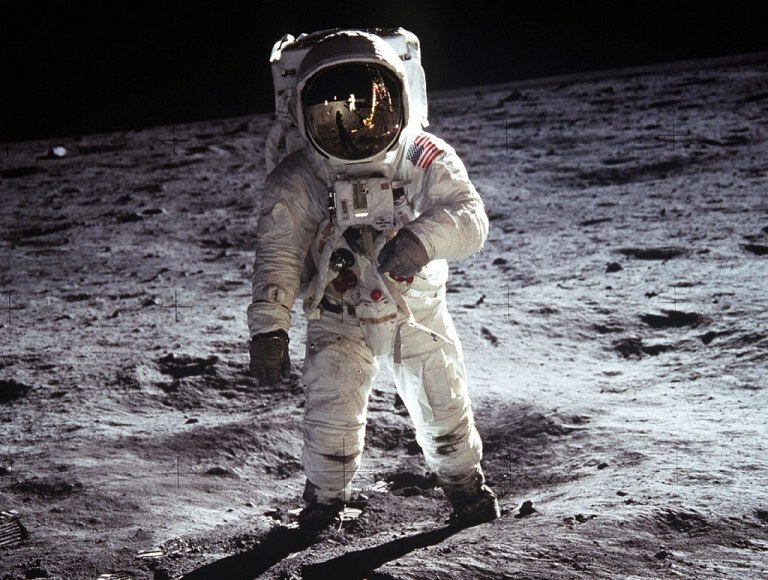 To mark his 80th birthday, we present some of the many Buzz Aldrin videos available online. The process of producing and distributing TVE Asia Pacific’s educational TV series, The Greenbelt Reports, is showcased in a new book on environmental journalism in South Asia, just published by Sage, a globally operating company that specialises in bringing out academic and professional books. Arranged in 10 sections, the book brings together contributions from three dozen journalists, broadcasters and film makers in South Asia. It opens with a foreword by Darryl D’Monte, one time editor of The Times of India and Chair, Forum of Environmental Journalists of India (FEJI). I co-wrote the chapter titled ‘Dispatches from the Frontline: Making of The Greenbelt Reports’ with my colleague Manori Wijesekera, TVEAP’s Regional Programme Manager. I was researcher and script writer of the 12-part, 4-country series that we made in 2006, in which Manori was series producer. The series looked at the environmental lessons of the 2004 Indian Ocean tsunami. The title reflects the lingering print bias in media related discussions: in our case, the content we produced was disseminated on broadcast television, narrowcast DVD and online. We wielded cameras rather than pens, but are still very glad to share our experience in this book. It’s an honour to be part of a book which features the work of respected seniors like Anil, Darryl and Sunita – all of who have influenced my own career and I’m privileged to count among my friends (alas, Anil is no longer with us). In fact, I have either met, worked with or am friends with more than half the three dozen contributing authors of this book. Who says South Asia is large? Every now and then, we come across a simple yet profound statement that sums up our work or our aspirations – or both. I must admit, now and here, that I’ve not seen any of his films (except for extracts online – does that count?). Yes, what a lot I have missed — but I’ve read a bit on him and been enormously impressed by how he plays with images, both still and moving, in a unique style of his own. The more I searched about him, the more impressed and amazed I became about his progressive and pragmatic comments about his art and craft. I’ve now run out of excuses for not seeking out Wim Wenders films. That’s one of my aspirations in 2010.